I never understood the allure of the Krispy Kreme doughnut until I tried one piping hot. I then saw why my coworkers deposited them in our break room almost daily (it wasn’t just a plot to make themselves look better by making the rest of us fat). The doughnut pusher got to enjoy a hot Krispy Kreme during their morning commute. Still sticky glaze and a plush doughnut does wonders to ease the pain of that Hummer in front of you that won’t let you pass. I work at home now. No one stops by the office with hot Krispy Kreme doughnuts. So, I figured that I should make my own. I learned how to make Krispy Kreme doughnuts from I Made That! My homemade Krispy Kreme doughnuts are not quite as sweet as the real ones and not quite as greasy (read that as good or bad, depending on your personal taste). My friend Carter said that my homemade Krispy Kreme doughnuts were the first doughnuts he’s ever had that didn’t have a weird artificial aftertaste. I’ve never noticed any odd aftertaste with Krispy Kremes, but I took Carter’s comment as a nice compliment. 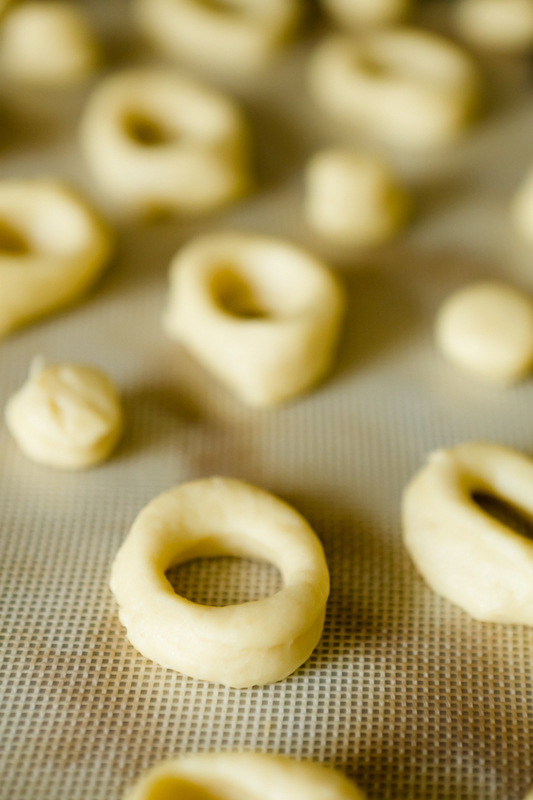 Mini doughnuts ready to be fried – plus the doughnut holes. You can serve every single doughnut fresh and piping hot. You can make the doughnuts any size you want. I made some mini ones that I used in cupcakes (stay tuned). You get to eat the doughnut holes. This recipe works best with super fine sugar. Here’s the kind I used. I used circle cookie cutters to cut the dough into circles and to cut the holes into the doughnuts. I have this whole set of circle cookie cutters so that I always have the size I need on hand. You don’t need a deep fryer to deep fry but it makes things so much easier and cleaner. I use this little one that doesn’t take up too much pantry space. As I noted above, I got the recipe for Krispy Kreme doughnuts from I Made That! I am reprinting it below with my notes and very minor changes. The recipe requires three different rising stages (each about an hour long) so be sure to make them on a day when you’ve got some time. My homemade Krispy Kreme doughnuts are not quite as sweet as the real ones and not quite as greasy (read that as good or bad, depending on your personal taste). Heat the milk to 100 degrees. You can do this in the microwave or on the stove top. Stir in the yeast until it is dissolved or close to dissolved. Transfer to a medium-sized bowl and mix in 3/4 cup plus 2 tablespoons of the bread flour. Stir until smooth. Cover the bowl (I like to use my cloth bowl covers for this) to prevent drying out and place in a warm spot to rise. When the batter has doubled in size (about an hour, depending on the temperature of your house), add it to a mixer fitted with a paddle attachment. Add the egg yolks, superfine sugar, and salt. Mix on low speed until smooth. Mix in vanilla extract and butter until smooth. With the mixer running, slowly add the rest of the flour (1 1/4 cups + 2 tablespoons). Keep mixing until the batter just comes together into a smooth dough. It will be quite wet and sticky, but should be able to hold together as one “lump” of dough. If not, add a bit more flour, one tablespoon at a time. Lift the ball of dough up and brush the bottom of the bowl lightly with vegetable oil. Cover the bowl again and place in a warm spot to rise. Once the dough has doubled in size (another hour or so), refrigerate it for 15 minutes. This will make it easier to roll out. On a well-floured surface, gently roll out the dough to about 3/8” to 1/2” thickness. Use cookie cutters to stamp out whatever shapes you like. I used a 3 1/2" circle for the large doughnuts with a 1 1/4" hole. For the minis, I used a 1 1/2" circle with a 15/16" hole (all of these cutters come in the same set). Save the holes to fry up as well, or roll the batter out again to make more doughnuts. Place the stamped dough on a parchment- or Silpat-lined cookie sheet, cover with plastic, and allow to rise again in a warm spot. Once the doughnuts are almost doubled in size (another hour or so), heat oil in a large pot or deep fryer until it reaches 360 F. I strongly prefer to fry in a deep fryer. It keeps everything so much cleaner and perfectly regulates the temperature. Fry the doughnuts in batches until golden brown on each side (you'll need to flip them mid-fry). The total frying time will be under 2 minutes. Use tongs to flip and retrieve them. Set hot doughnuts on paper towels to absorb extra oil. Mix all ingredients in a small bowl until smooth. Drizzle over piping hot doughnuts. If necessary, reheat doughnuts in the microwave for about twenty seconds. I love doughnuts! I must try this! If I succeed this will be my third successful doughnut!!!! Krispy Kreme uses potato flour NOT bread flour. i don’t have bread flour… any substitute? You could try it with all-purpose flour, but I can’t promise that it will work as well since I’ve never done it. All purpose flour works fine……just a little airier with bread flour. go to the supermarket and purchase the flour, it’s that easy!!!!!!!!!!!! The only consistent advice about converting all-purpose flour to bread flour is that you have to add some wheat gluten (aka vital wheat gluten – all major grocery stores should carry this in the baking/spice aisle). The problem is that no one agrees on an amount. The Red Star Yeast company suggests adding 1 teaspoon of vital wheat gluten to 1 cup of all-purpose flour; Cook’s Thesaurus recommends 2 teaspoons of gluten per 1 cup of flour; TipNut.com recommends adding 1 tablespoon of gluten to an unspecified amount of all-purpose flour; and Better Homes and Gardens suggests 1 to 3 tablespoons of gluten per recipe. The amount of gluten all-purpose flour already has can vary, so before you add more it is probably a good idea to bake some test recipes. Start adding small amounts of gluten to the tests to see how they work out. Unfortunately, this will be a trial-and-error process. Oh dear me… I am at the same time excited and horrified that you have posted this recipe… I have not had a KK doughnut in ages, and methinks that I am going to have them more regularly – at least, Sahar-style KK doughnuts ;) Thank you! Lovely.. homemade donuts! Will have to try this. Wow, that’s incredible! I don’t care for most doughnuts, but I LOVE Krispy Kreme! I rarely get them, though. I will have to try this recipe. Thanks for posting it with such good details, very helpful! WOW!!!!! I will have to try this recipe…love Krispy Kremme!!!! I’ve never made doughnuts, and when I have them my taste runs to the filled ones. I do like Krispy Kreme’s though, but as you say they’re much better when warm (although I think that applies to any doughnut). My only gripe with Krispy Kreme’s is they’re so sweet – but of course I eat them anyway. Nice post – thanks. A must try! I looove KK doughnuts, now that I have nowhere to buy them, I’ll have to start making my own ;) Thank you so much for the recipe. I don’t think I’ve ever noticed an artificial taste with Krispy Kreme doughnuts either, but if this recipe produces one without it, I’m all for it! The doughnuts look great! Oh SWEET! I’ve been craving KK ever since they closed down the last one in town a few years back. I often wondered how they were made, now i can make them, they are so delicious, but i will remember to get bread flour and make some for my family to enjoy, my hubby especially.Thank you for the recipe for all of us. Can I use regular butter? what will happen if I do? It will be fine. Just cut the amount of salt that you add to the recipe in half. Must try! I only wish there was a way to bake these instead of frying. Do you think baking would work? OMG! THANK YOU. NO KK DONUTS NEAR MY HOME. THEY WOULD MAKE A BILLION DOLLARS IF THEY CAME TO MUNFORD, TN. The dough isn’t all that delicate. You can just pick it up. did anyone try it? how was it? were they light, airy and sweet like the KK? also can i substitute bread flour with all purpose flour? I just cried. i love doughnuts so much. So, I made these this week and though they tasted good, they were nothing like KK. However, it was my first try. Though my biggest problem was the shape. You see, the dough is incredibly, incredibly soft and it doesn’t say anywhere to add more flour to make the dough more ‘useable’. It was just so soft. They rose beautifully and I hope during that time some strange magic would happen and they would stiffen slightly, but alas it did not! Shocker! So moving them from cookie sheet to deep fryer was a mess. Most of my donuts looked pretty ridiculous. though, like I said, they tasted good. Actually, they tasted pretty great. My daughter went crazy over them even though they looked ugly as sin. Mine weren’t light and fluffy, but they kinda deflated when I moved them so that could be why. Fooey! Any advice? Should I have added a lot more flour and kneaded it in? I noticed there is no kneading in this recipe (nor in a couple other copycat KK recipes I have viewed online). Help! I certainly am not finished with donuts! I made doughnuts for years and I think they are better than Krispy Kremes.I like to put different types of glaze on them. Try adding cherry snowcone syrup to the glaze. I have had great reviews. These are the worst tasting donuts we’ve ever had. These are nothing like Krispy Kremes…first the real Krispy Kremes are white inside after cooking, these are yellow from the butter. Almost made us sick. It should be against the law to call these things Krispy Kremes. Tried cooking at both 325 F and 375 F and both came out with a strong butter taste. Yuk! There are ways of saying things without being totally rude. You should look into that. 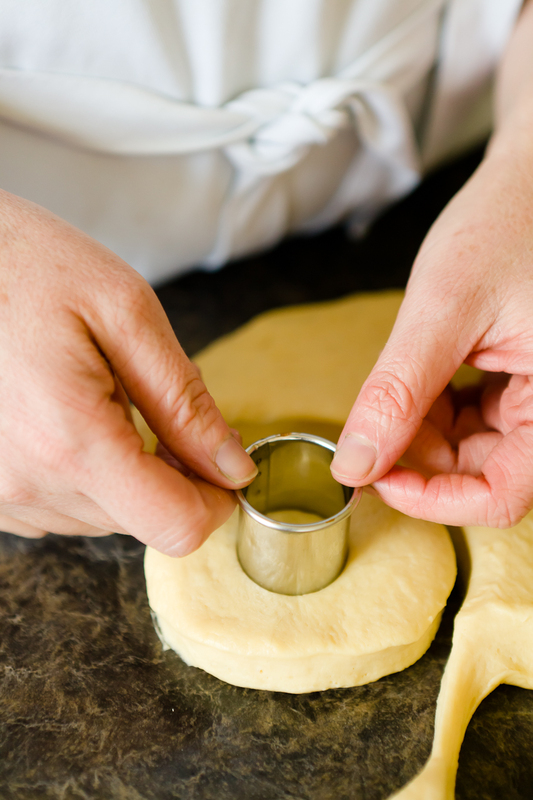 If you dont have round cookie cutter, can you use the fluted set? I have a set of round fluted set but not sure if these will work too. Thanks. When KK 1st came to Denver, I tried one, and analyzed the frosting. The little dark flecks in it are cinnamon. There isn’t much, but just enough to add a slight flavor. The problem with KK donuts, besides being smaller and higher priced, is that they are great when hot, but aren’t good when they get cold. All 12 stores are now gone. They faired badly in the donut taste test here, and came in 7th. Lamars are FAR better, larger, and less expensive. They came in #1. 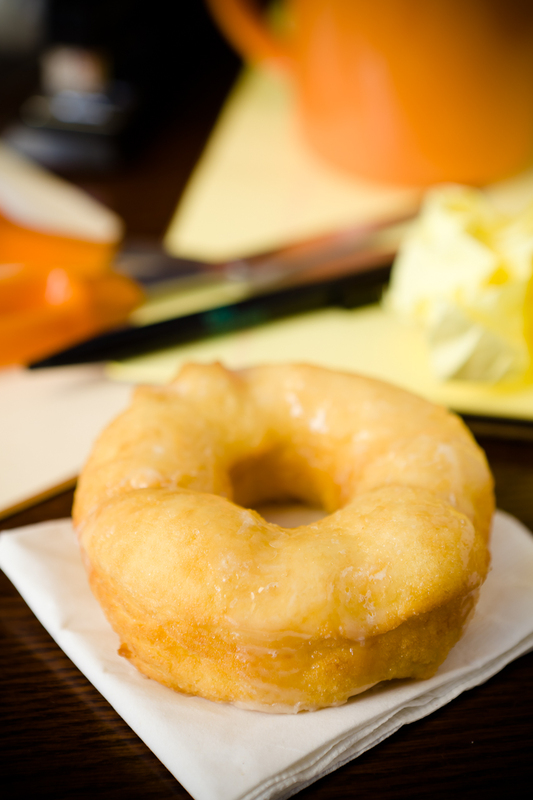 I make Krispy Kreme doughnuts…….my recipe isnt anything like this one……..i use 5 C of flour for two batches. Can we bake them the same way?